It was Saturday, June 2, the Republic Day in Italy, which celebrates the country’s abolition of the monarchy in 1946. Streets were mostly empty in the morning. Local folk were taking a rest at home on this traditionally leisurely national holiday. I was in Marsala, the west Sicilian town known for Giuseppe Garibaldi’s one-thousand-men landing on their mission to conquer the Kingdom of the Two Sicilies in 1860 and the eventual unification of Italy. On this day, as local people got ready to have their pasta lunch with families, a parallel world moved at an entirely different pace only a few miles away. Out there in the vast green fields that surround the town, Sanji and other Gambian workers were working under the fierce sun, over 30 degrees, on this early summer day. They were tidying up weeds and looking after the thriving vineyards, growing bigger and thicker by the week. No, the Africans aren’t “taking” local jobs. Local people simply don’t want to work in the fields. They see it as beneath them. Local youth who feel there are no future prospects for employment would go to look for work and seek their fortunes in northern Italian cities or abroad. Marco, a middle-aged man born and raised in a farming family in Marsala, told me that he spent nearly two decades working hard as a hotel driver in Milan and then as a waiter in a Mexican restaurant in west London, to be able to buy homes and build a secure future for his family. He didn’t want to work on his dad’s vineyards which supplied the small local winery. He wouldn’t have what he has today – a 2,000-square-metre, beautiful country house, properties in town, and three family cars – if he had stayed on the family farm in rural Sicily. For the young, as he was some twenty years ago, farming simply wasn’t the future they saw for themselves. Farm work is physically demanding, the working hours are too flexible, the reward traditionally small. As they say, no [local] person in their right mind would want to be toiling on farms. Naturally, someone else with less options in life, like Sanji and his fellow Gambians, would come and make up for the shortage. Matteo Salvini, the leader of Italy’s far-right party La Lega (The League, which used to be called the Northern League) and the country’s new deputy prime minister and interior minister who is now in charge of immigration, said that “the good time for illegal immigrants is coming to an end”. Firstly, Salvini has never set foot in a Sicilian farm. No one in their right mind would say that toiling in the fields in southern Italy is a “good time”. Besides, who are the “illegal immigrants” he is talking about? Displaced people who risk their lives to escape conflicts and poverty and end up being treated as commodities in reception camps and having to wait indefinitely for their documents? The people upon whom Italy’s agriculture has depended but refused to reward their labour like that of fellow human beings? Vineyards, Marsala (taken by Hsiao-Hung). All rights reserved.For the long day’s work they do in the fields, Sanji and other African workers are paid two to four euros, per hour, depending on the individual agreement they have with the individual farmers. There are no rules about it and how much you earn for your labour is simply a matter of “luck”. And when bad luck comes to you and the farmer decides to renege on the deal, you don’t get paid at all. Whether you happen to be working during Ramadan and enduring the whole working day without food and water is none of the farmer’s slightest concern. Despite the poor working terms and conditions, many African workers have to accept the unacceptable. There was, literally, no choice, as most other work opportunities are denied them. Therefore, no matter how bad things are, they will always return to work during harvests. By the autumn, when these vineyards in Marsala and elsewhere are ready, the farmers will never be short of workers. On the evening of the Republic Day, after the African workers in Marsala broke their fast, had dinner and exchanged greetings with their families and friends on social media, they got to hear the news about the horrific racist murder of a 29-year-old young Malian man named Soumaila Sacko who lived in a makeshift camp on the outskirts of San Fernando, in the province of Reggio Calabria in southern Italy. His camp sprang up after local residents’ violent “ethnic cleansing” where three migrant workers were shot with an air rifle, many were beaten and more than fifty injured in January 2010, prompting hundreds of migrant workers to flee town. Since the new camp was set up, the site had always gathered at least 3,000 migrant workers during the harvest season, with the same appalling living conditions and no protection for health and safety. Back in January, Becky Moses, a 26-year-old Nigerian woman, was killed in a fire there. Sacko’s murder shocked, angered and traumatized not only his fellow workers, but also migrant farm workers beyond Calabria. 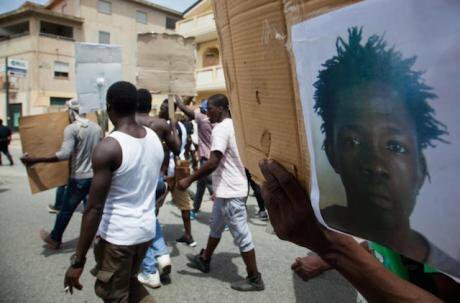 No one could ignore the fact that Sacko was murdered just hours after Salvini was sworn in as the country’s deputy prime minister and interior minister, the man who had built a political career on inciting racial hatred. The new government, Salvini said, will set out to increase the number of detention centres in order to deport their pledged 500,000 “illegal immigrants” (assuming Italy was able to sign deportation agreements with all the countries involved). This is on top of the fact that the previous centre-left government had already reduced the total number of incoming migrants by 75% by signing deals with factions and militias in Libya which helped trap tens of thousands of Africans inside Libyan detention prisons and enabled the most horrific human rights violations. The new government, with the far-right at its centre, most certainly does not care about the tremendous human suffering of the proposed deportations. When questioned about the fiscal costs, Salvini hinted at the possibility of transferring the current state resources allocated for reception camps to the use of funding deportation, which currently doesn’t look remotely affordable in Italy. This is the extremely hostile environment in which “outsiders” from the Third World find themselves in this country. “Migrants”, “refugees”, “illegal immigrants”, whatever the label might be, they are sure to be talked about and decided upon like objects. They are truly, in the eyes of the “Italians first” ideologues, lesser humans. Soumaila Sacko had lived in this hostile climate in Italy since 2010 and saw that things had got to change. He began to campaign for rights for fellow migrant workers. During his time working in the fields picking fruits in San Fernando, he was a USB trade union activist. His union had helped represent thousands of migrants working in agriculture in southern Italy. On Republic Day, Sacko wanted to help his two friends and walked with them to San Calogero a few kilometres away, to collect scrap metal from a disused factory, so that they could build their shack in the tent area where they lived in San Ferdinando. This is the norm for migrant farm workers’ living conditions across Italy: they have to build their own shacks and tents with no basic facilities, because farmers do not provide accommodation to them, despite being legally obligated to do so. The horrendous exploitation on the farms and appalling living conditions have utterly segregated African workers from society; it has created ghettoes in which African workers enjoy no healthcare and no institutional labour protection. The tent area where Sacko and his friends lived was one of Italy’s biggest ghettoes. Living on the very edge of society means that life is filled with real, day-to-day risks to personal well-being and safety. Around these segregated communities, African workers often encounter direct racism, racial harassment and at times racial violence. That night, when Sacko and his two friends had picked up three metal sheets for their shack, a white man drove up and fired at them, four times, with a shotgun. Sacko was hit in the head; he couldn’t be saved and died in hospital. A young man and a well-respected activist. He had his whole life in front of him. Racism brutally took it away.